Our rapidly changing urban landscapes reflect a society in flux. As skylines reach new heights and highlines create new pathways, the character and flavor of urban neighborhoods face the unique challenges of gentrification. Marking clear lines that speak to social justice and equity, the transgressive movement of urban renewal provides a canvas for expression and awareness. Within the trend of mixed media, bright colors, and monumental scale, these public works articulate the narrative of the culturally diverse neighborhoods and communities where they live. 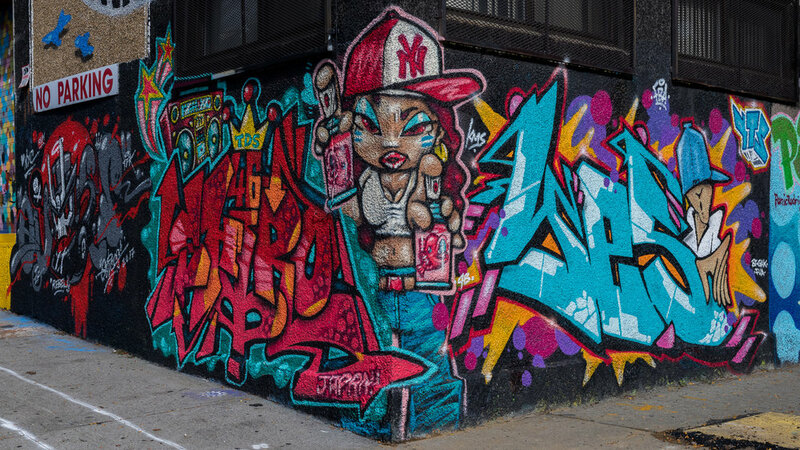 The evolution and acceptance of Graffiti and non-commissioned Mural art into the mainstream has opened new doors for a genre outside the canon of art history. Stylistic nuance and dialectic fluency work in concert redefining many urban areas on the cusp. While many artists are enjoying new celebrity within commercial markets, the thrust remains tightly coiled and attached to mission: a democratic and reflexive artistic experience.Yesterday’s vandals are today’s mentors within a global movement addressing the issues of today without artifice, privilege, or exclusion. 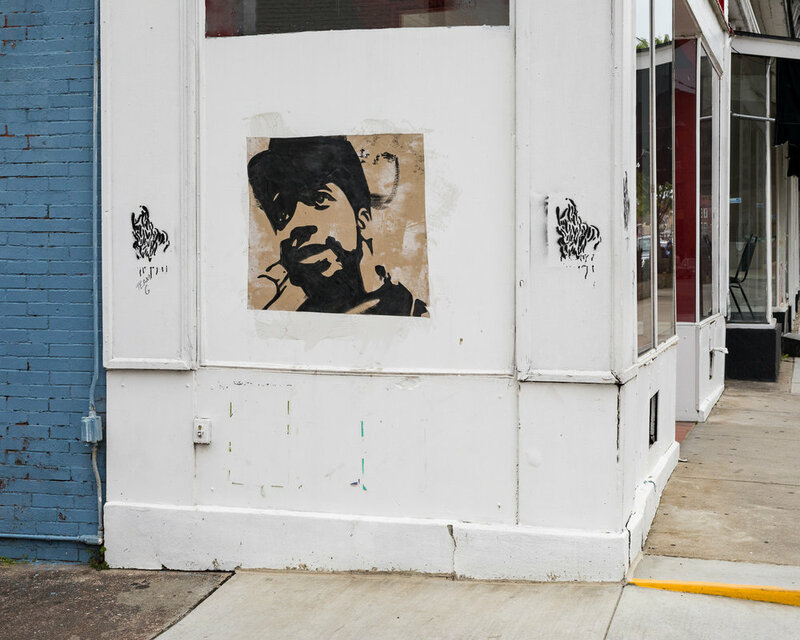 Focusing the lens on Queens, New York and Memphis, Tennessee our goal is to introduce a fresh context that explores the artistic strategies of the genre in relation to public arts access and its impact on social justice. The mural lies within a long tradition of public art. Giving voice to a wide variety of perspectives, the mural and graffiti function as societal markers. 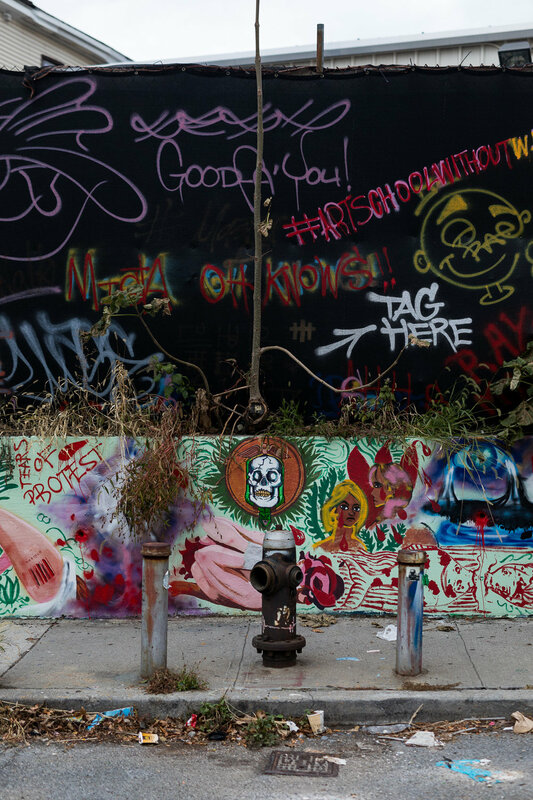 Artistic expression takes shape in public spaces, transforming sometimes forgotten and underutilized areas into a venue for artistic experiences. The narratives weave together, revealing a greater story of shared passion and commitment to nurturing an environment where the benefits of access to the arts can be witnessed each and every day. In October 2017, David Katzenstein and Gay Feldman began working with Garrison Buxton, the founder of The Welling Court Mural Project. Each year artists come from around the city and the world to participate in a weekend long event. Working in teams and individually, their dedication to providing an ongoing artistic dialogue with one another, and the residents who call this neighborhood home, focuses a lens on the benefits of public arts access. 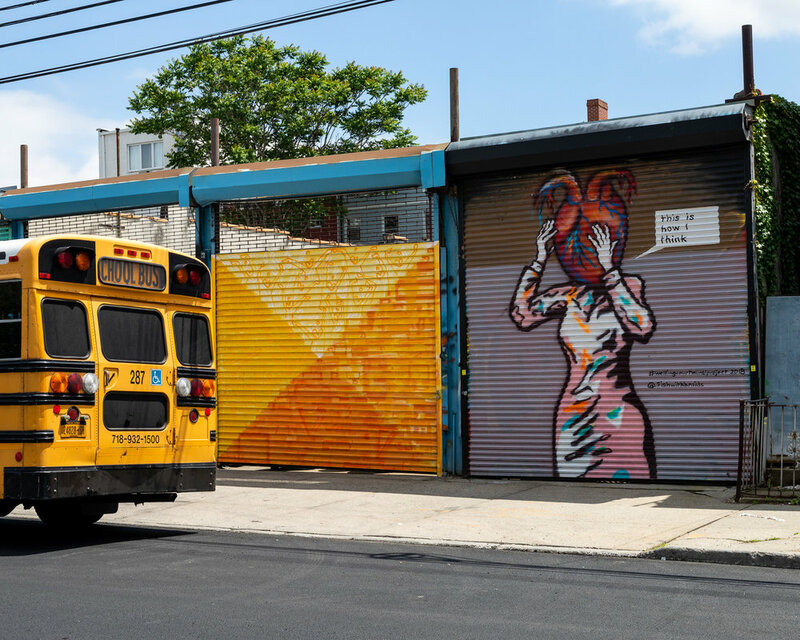 An artistic enclave, Welling Court sits at the center of an amazing cultural crossroads where cooperative efforts yield extraordinary experiences for all of its residents. The project serves as a galvanizing force helping cement the rich and socio-economically diverse neighborhood surrounding Welling Court through an exchange of artistic experiences, education, and creation. Originally conceived as a neighborhood beautification project, local business and property owners championed the cause, donating their public spaces in support. Since that time, the project has grown block by block, artist by artist. The art produced through this expansive mural project reflects the spirit of its residents through subject matter, artistic strategies, and authorship. 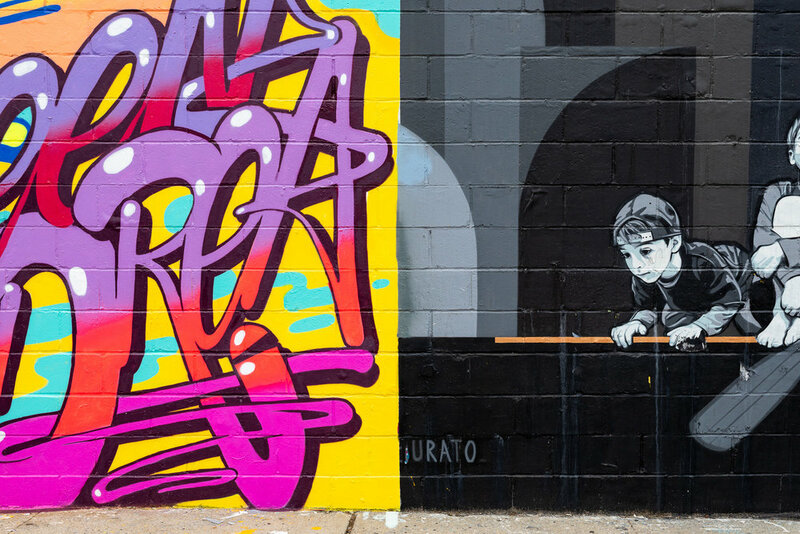 Hailing from Latin America, Europe, The Pacific Rim, Asia, North America, and the immediate community, participants in this revolving mural project mirror the cross culture of Astoria itself. Buried deep within the rich landscape that rests upon the delta lies the artistic legacy that influenced social change around the world. Birthplace of the Blues and Rock ‘N’ Roll, Memphis has come to represent a uniquely American art form. Inspiring and liberating, the voices captured on vinyl and in the collective consciousness have shaped new attitudes, forging greater bonds of solidarity among all people. As the civil rights movement gave way to social change, Memphis continues to be at the center of our national discourse. A city undergoing rapid economic change, local artists continue to use their voices to address the polemic of human rights and social justice issues. 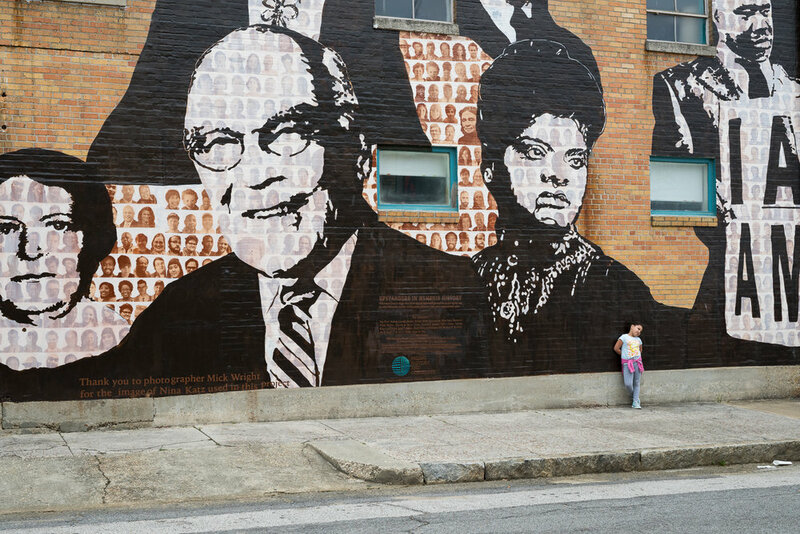 While the majority of Memphis’ population still struggles with access and economic advancement, public support for mural projects functions as a means of agency inspiring dialogue, identity, and hope. 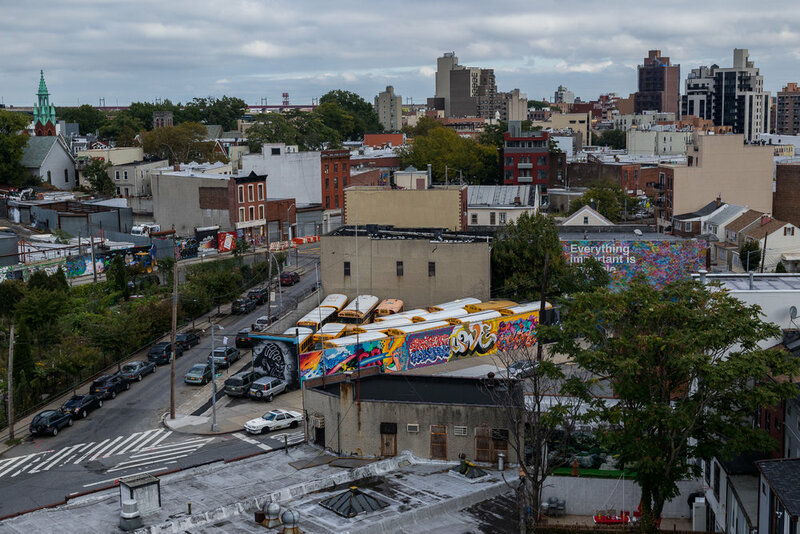 The Welling Court Mural Project is part of Katzenstein’s larger body of work, The Human Experience, a collection of his visual explorations that span over the past 30 years. His work presents the positive aspects of peoples and cultures, and takes the viewer on countless journeys near and far.